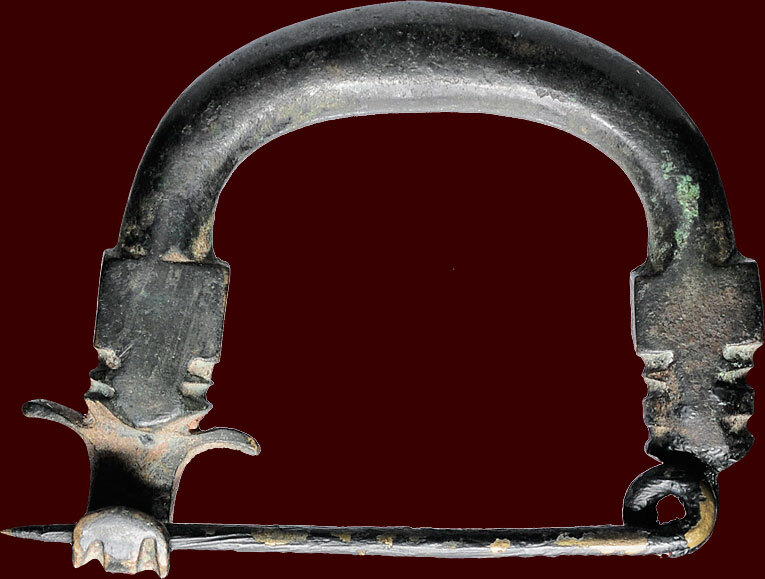 ARCHAEOLOGICAL OBJECT - IRON AGE - GREEK - ASIA MINOR - Bronze Phrygian fibula, 8th/7th century B.C. weight 57,25gr. ; bronze L.60mm H.45mm. height circa 40mm. ; width circa 80mm. ; weight 27,95gr. height circa 72mm. ; width circa 82mm. ; weight 41,45gr. Standing woman with full length skirt. 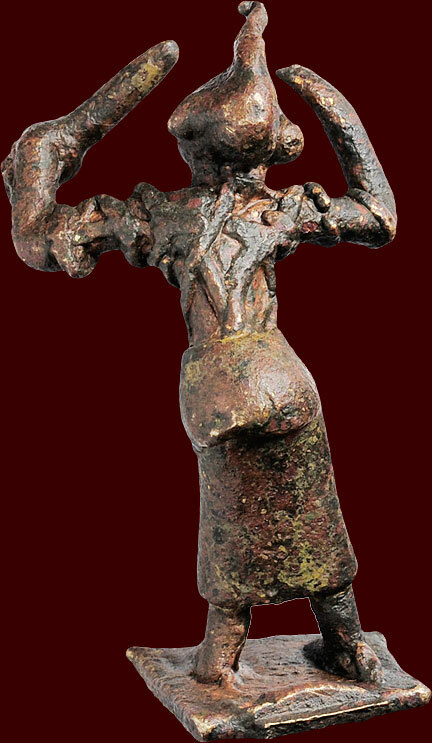 The Tanagra figurines were a mold-cast type of Greek terracotta figurines produced from the later fourth century BC, primarily in the Boeotian town of Tanagra. They were coated with a liquid white slip before firing and were sometimes painted afterwards in naturalistic tints with watercolors, such as the famous ″Dame en Bleu″ (″Lady in Blue″) at the Louvre. 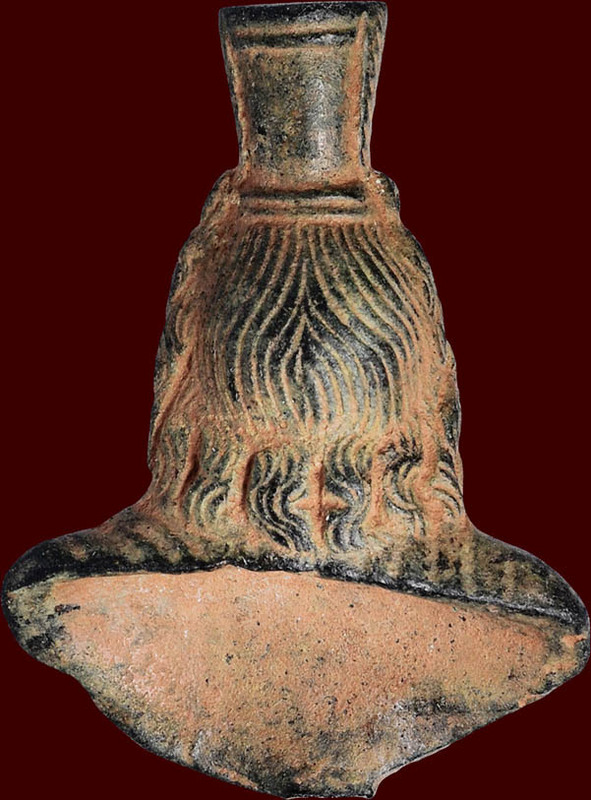 Scholars have wondered why a rural place like Tanagra produced such fine and rather ″urban″ style terracotta figures. 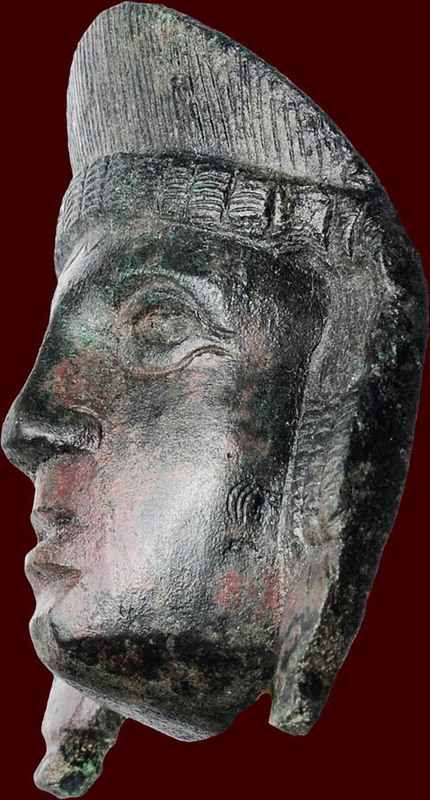 Tanagra figures depict real women — and some men and boys — in everyday costume, with familiar accessories like hats, wreaths or fans. Typically they are about 10 to 20 centimeters high. The terracotta figurines were placed in temples as offerings to the gods, or in tombs. 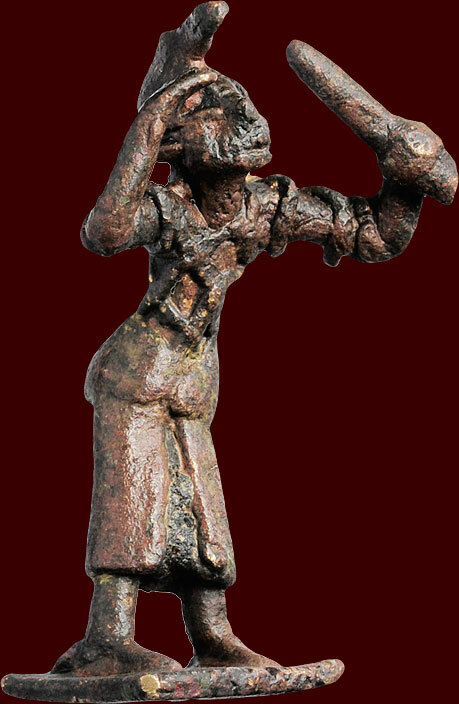 This statuette represents a typical ″Tanagran″ subject – the draped figure of a woman. The statuette′s elegant, sculptural form despite her small size, and the beauty of the drapery make this a highly successful representation of the human figure, reflecting two central themes in ancient Greek statuary – the female body, and feminine garments. The influence of the Greek sculptor Praxiteles, who was active in the 4th century BC and is credited with the introduction of several female figure types, is clearly apparent in the handling of the drapery, and the pose. Not totally intact. Some little damage and repairs; at the left and back side of her head and at the backside of the base. Gold. Length 28mm. ; weight 4,19gr. Gold pendant or earring with loop, in the shape of a turtle. With granule decorations. 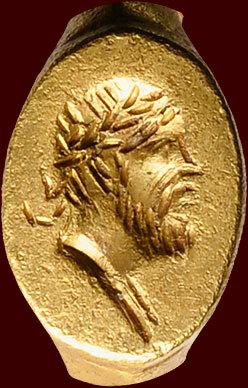 This is a wonderful example of ancient granulation work. 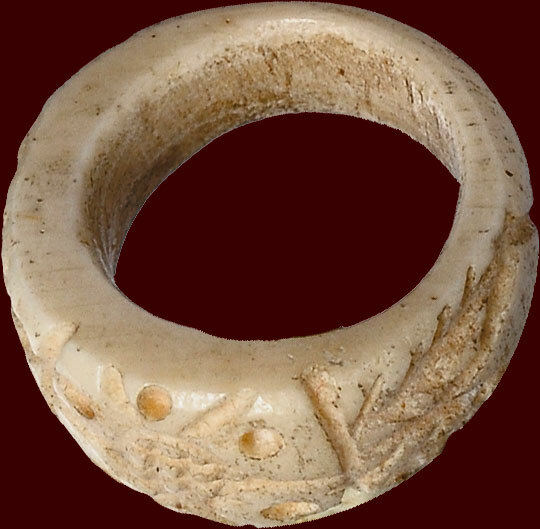 The granulation technique is estimated to be 5,000 years old, originating in Sumer. 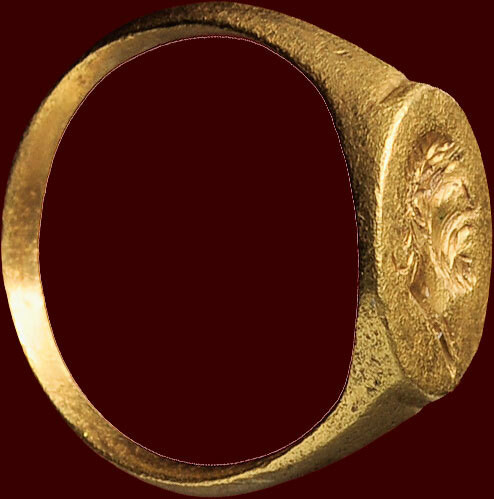 Granulation was also used by the Etruscans in the first millennium BC. Greek craftsmen also adopted the technique and eventually the Romans as well, but it was the work coming from Etruria which became famous because of the mystery surrounding the process. Very rare piece of jewellery art. tied in a chignon at the back, surmounted by a stephane. Minor chips, but with expressive details in the face. Gold Ø 12mm. ; weight 4,28gr. 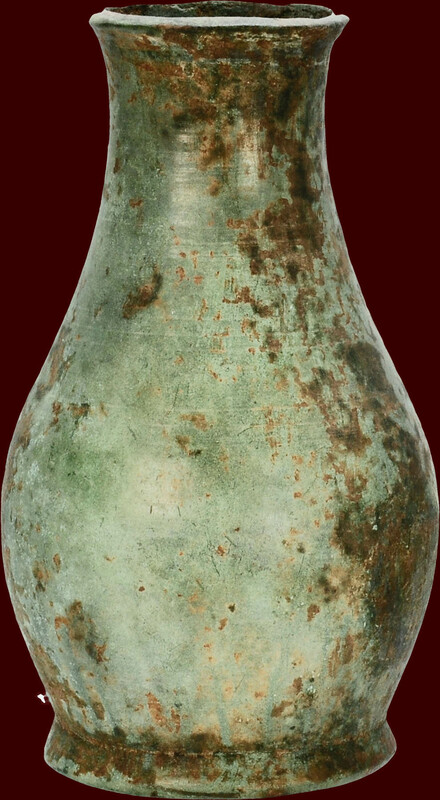 a twohandle vase, with a bird standing left on top. and was common used in the following centuries. Condition: Rare and unique piece. Extremely fine condition. height 22mm. 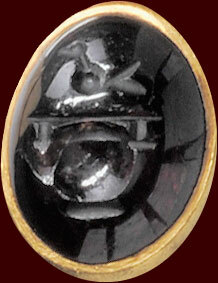 ; black glass ; weight 10,63gr. Length circa 54mm. ; Height circa 47mm. (outside diameters). Nice bronze bracelet, formed from solid metal stock with decorated flattened sides. Found in the Eastern Danube region. 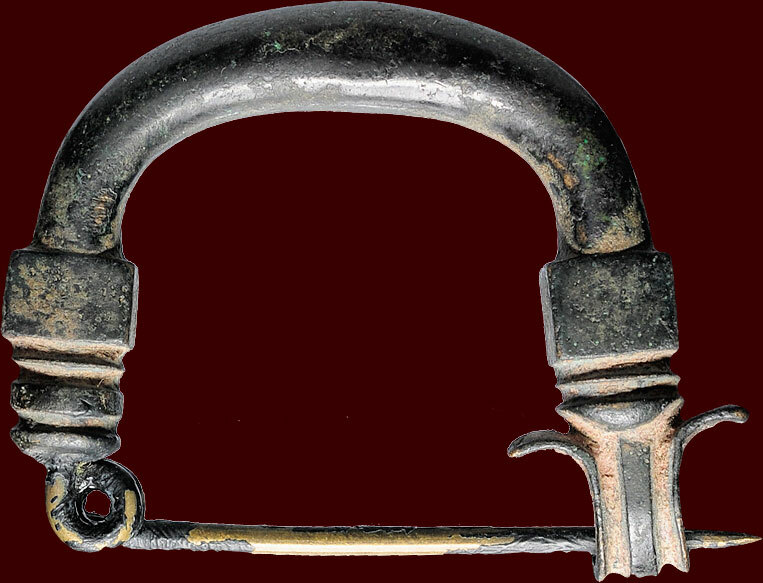 ARCHAEOLOGICAL OBJECT - ROMAN - CENTRAL EUROPE - Silver fibula, 1st century A.D.
weight 23,88gr. ; L.48mm. W.32mm. Standing bird to right, decorated with small circles with dots in the centre. weight 17,81gr. ; length 53mm. Found in Calabria (South Italy). Pin missing, for the rest intact. Dark green patina. Very rare. Beautiful bronze patera handle with a fluted body and a ram head finial. 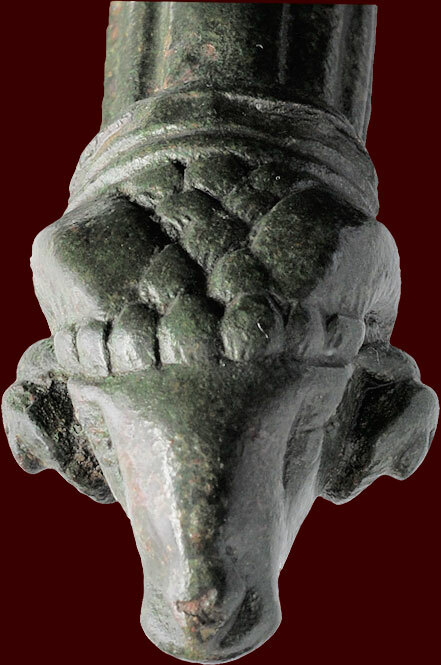 The ram′s head is very finely incised, with a particular attention to the wool details. Naturalistically modelled with large ridged tightly curled horns, almond-shaped eyes and fine mouth and nostrils. Very good condition. Dark green patina. height 54mm. ; gold ; weight 7,01gr. From the eastern Mediterranean area. Wonderful piece of fine art. Very rare. height 62mm. ; weight 121,42gr. A cast eagle figurine on a hollow square base, feather detailing to the wings and chest. 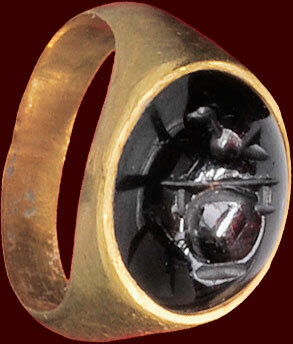 Wonderful piece with attractive dark patina. Some minor bumbs. Attractive green/blue patina. length circa 58mm. ; bronze 23,27gr. 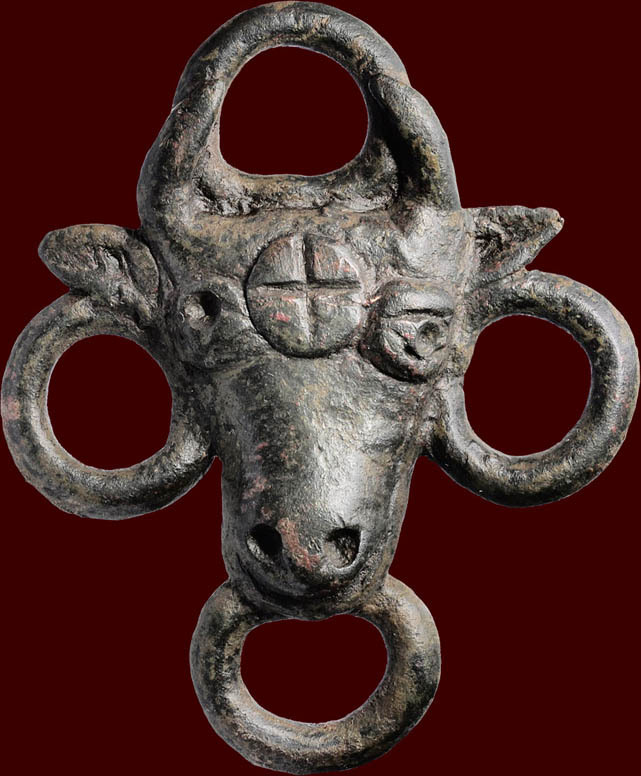 The bull was a powerful symbol in many ancient religions, none more so than in that of Egypt, where the animal was worshipped as the god Apis. The Romans found it easier to accept the Apis bull than some of the more exotic deities of the Egyptian pantheon, like the ibis-headed god Thoth or the jackal-headed Anubis, and they ridiculed Egyptians as worshippers of animals such as cats and crocodiles. This expressive bronze bull-figure is a work of high craftsmanship. On the lower backside a part of the metal is missing. height 49mm. ; weight 43,52gr. The god, with Greek and Egyptian features, wearing a chiton and himation over left shoulder, surmounted by the modius headdress. The modius is decorated in front and sides with floral motives. 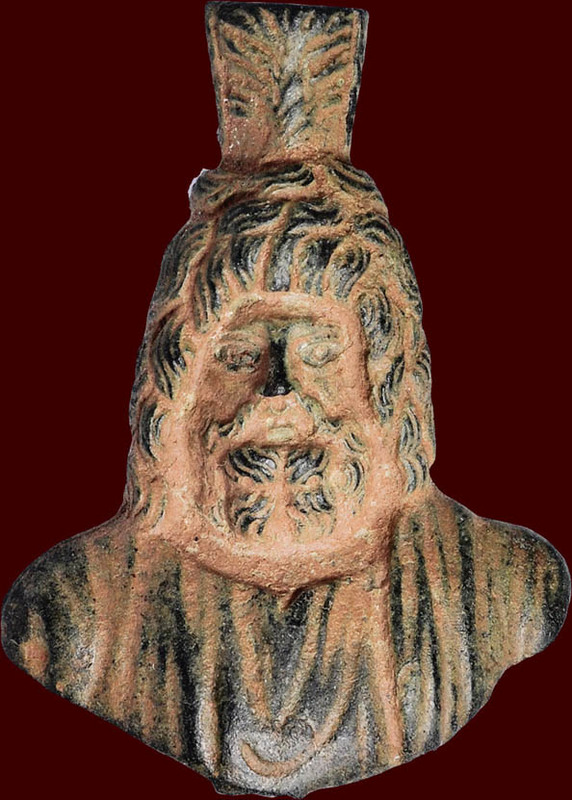 Serapis has a luxuriant full beard and thick long wavy hair falling in curls at his back. Perhaps more than any other deity, Serapis embodies the multicultural nature of the ancient Mediterranean world. He was essentially a creation of the Greek rulers of Egypt, a conflation of the local gods Osiris and Apis, though depicted as Greek in appearance. He wears the modius (grain basket) on top of his head, signifying his role as the god of plenty. This head might have been placed as a dedication in a Serapeum. Hellenistic Age, New York, 1961, figs. 296-7, for parallels. Wonderful piece or art with excellent details. height 55mm. 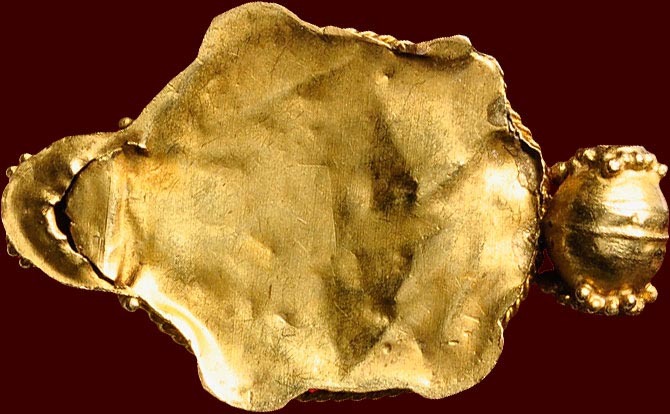 ; gold ; weight 2,82gr. 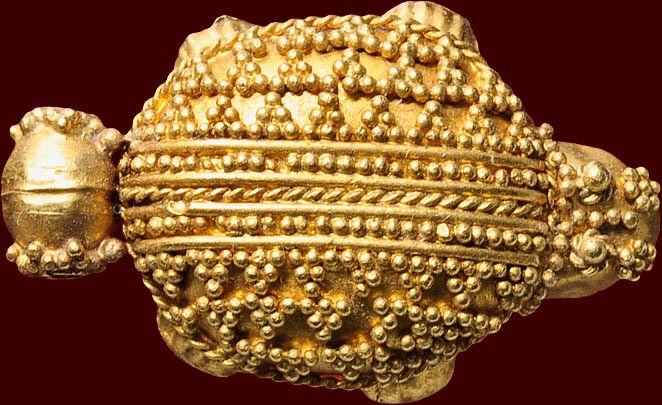 This ancient pin in fine gold was probably used as a hairpin. Some engraving on the bezel. weight 3,11gr. ; height 45mm. ; wide31mm. Depicting Roman Goddess standing left within double lined square of dots. Ø circa 37mm. ; bronze 13,42gr. 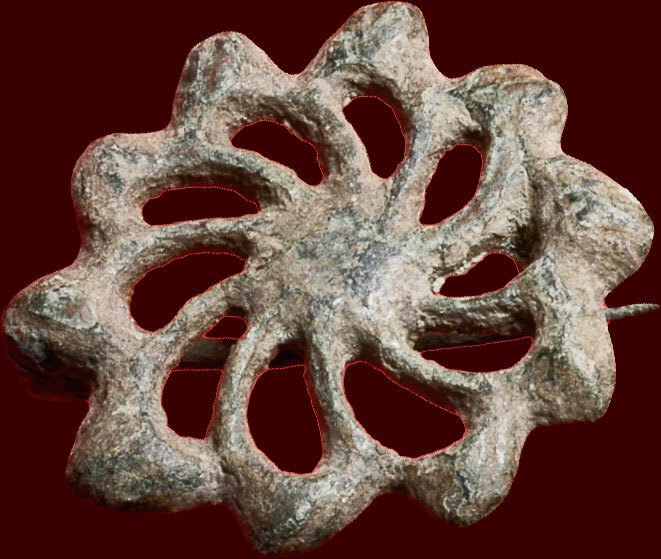 Openwork plate brooch in the shape of a rosette. height 55mm. ; weight 36,25gr. This male figure holds a short sword in his left hand. His arms and body seems to be tied with robes and he wears a Phrygian cap. Maybe a figure of a slave is meant here. Very rare. height 82mm. ; width 50mm. ; weight 68,59gr. 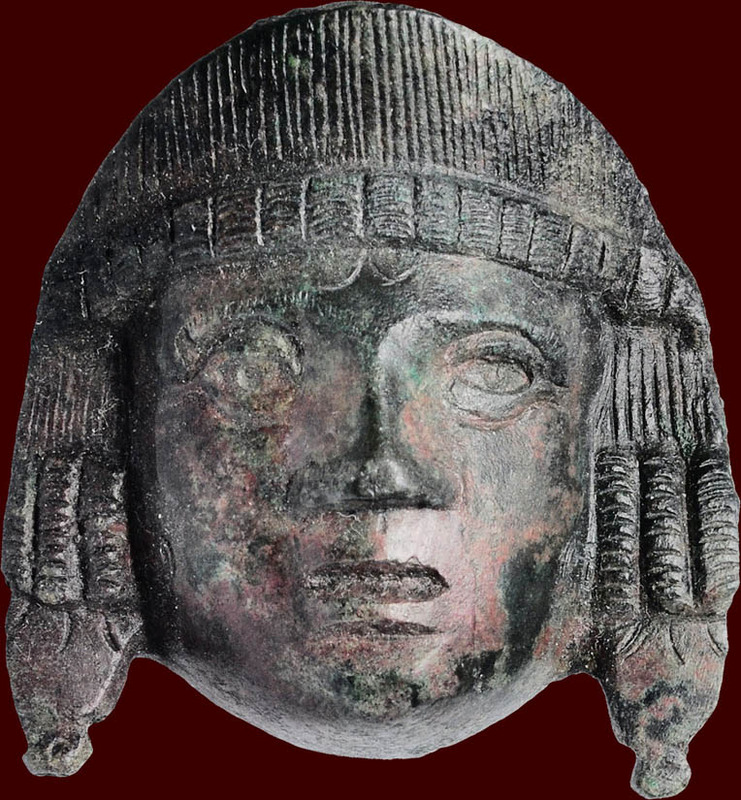 Finely worked bronze applique in form of a theatre mask. hair pulled up and hold by stephane. High-quality Bronze applique. Probably used as furniture decoration. Provenance; German private collection, acquired between 1970 and 1980. Some decoration on the oval plate. length circa 32mm. ; weight 11,30gr. The cicadas are a superfamily, the Cicadoidea, of insects in the order Hemiptera (true bugs). They are in the suborder Auchenorrhyncha, along with smaller jumping bugs such as leafhoppers and froghoppers. The superfamily is divided into two families, Tettigarctidae, with two species in Australia, and Cicadidae, with more than 3,000 species described from around the world; many species remain undescribed. In ancient times the cicada was polyvalent symbol: resounding themes are resurrection, immortality, spiritual realization and spiritual ecstasy. For the ancient Greeks and Romans they sang in intoxicated ecstasy and were sacred to Apollo and cognate with the dionysiac bacchae and maenad. A cross of light bearing the inscription “in hoc signo vinces” (in this sign you will conquer) miraculously appeared to Roman Emperor Constantine before the battle of Milvian Bridge. His victory over his brother-in-law and co-emperor Maxentius and subsequent conversion to Christianity had a profound impact on the course of Western civilization. 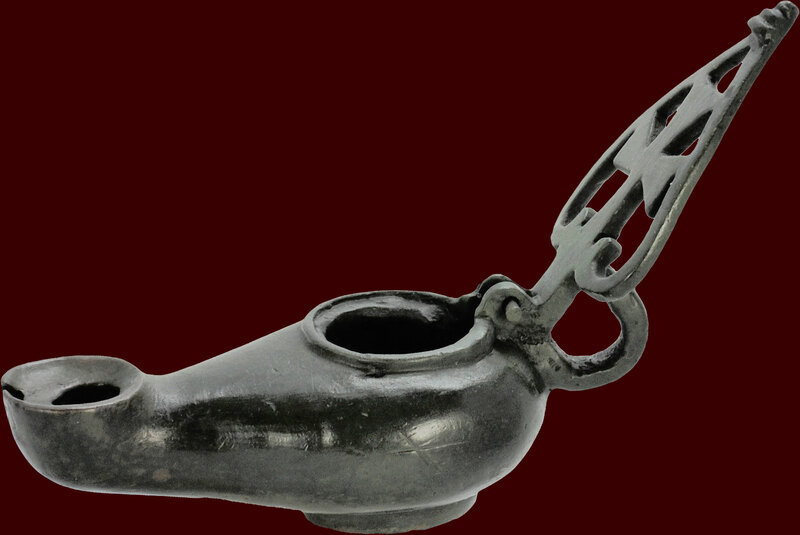 This bronze oil lamp dates to the late Roman / early Byzantine era. The ring handle is surmounted by a leaf-shaped attachment incorporating a Christian cross. The filling hole was covered with a hinged lid, but that is missing with this lamp. 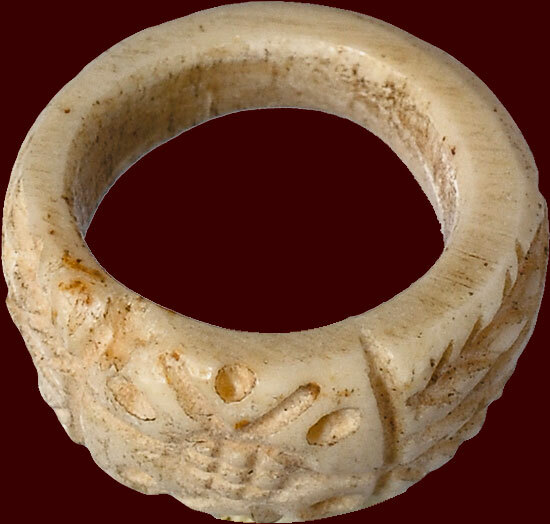 The spout terminates in a wide circular opening for the wick.The majority of lamps in the ancient world were fashioned from clay. The use of bronze was a costly and luxurious alternative. Not completely intact; minor damage (hole) at the spout, and the lid is missing. Bronze ring with pointed oval shaped bezel engraved with cut linear design. weight 123,01gr. ; height 92mm. ; wide 76mm. literature: Die Welt von Byzanz. Europas östliches Erbe.